Heads up! As of the writing of this tutorial, Scratch 3.0 and 2.0 does not fully support the PicoBoard. We suggest using Scratch 1.4 until the full PicoBoard extensions are implemented, tested, and rolled out with Scratch 2.0+. Scratch is an amazing tool to teach kids how to program. Often, we focus on creating fun animations, games, presentations, and music videos in Scratch. But, imagine how how cool it would be if you could add physical interactivity into your Scratch animation. For example, what if your Scratch character started to dance when you turned off the lights in your room or stopped as soon as the lights turned back on! With the PicoBoard, we can do all of this and more. 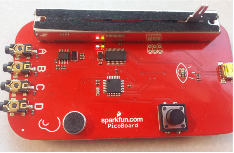 The PicoBoard is a piece of hardware called a sensor board that can be combined with MIT's Scratch programming environment to allow your Scratch programs to react (and even respond) to events happening outside of the computer. (If you're unfamiliar with Scratch and would like to learn more about it, read the Science Buddies Introduction to Scratch page.) A sensor is a device that detects (senses) and measures the presence or absence of something. The PicoBoard is actually made up of several different types of sensors so it can detect many different "somethings," including sound and light. Slider: Changes values from 0 to 100 based on the position of the slider. Light Sensor: Changes values from 0 to 100 based on the amount of light on this sensor. Button: The position or state of the button controls the button pressed value (true or false). Sound Sensor: Changes values from 0 to 100 based on the amount of sound it detects. Auxiliary Connections (A,B,C,& D): Alligator Clips: These are generic connections to any resistive sensor. As the resistance changes, so does the input value. 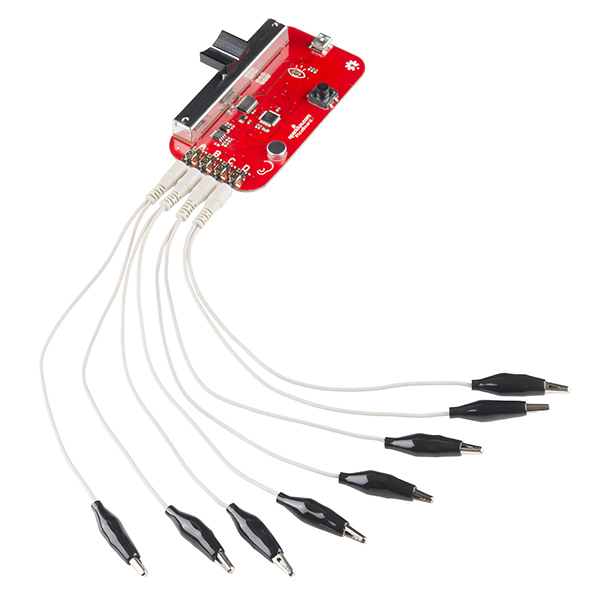 This sensor can also be setup as a digital detector to detect whether the alligator clips are connected. Note: Currently, the PicoBoard is only compatible with Scratch 1.4. To get started, you will need to install Scratch 1.4 for your computer. Visit scratch.mit.edu/scratch_1.4/ to download version 1.4 of Scratch. At this moment, the interface between Scratch 2.0 and the PicoBoard is currently under development. We are still working out the kinks of this. We recommend using the older and stable (v1.4) version of Scratch for interfacing to the PicoBoard. In addition to installing Scratch, you will need to install the FTDI drivers for your computer. The FTDI driver will allow the PicoBoard hardware to communicate with your computer. Follow our guide here on how to install and setup the drivers for your machine. Using the USB cable, connect the PicoBoard to your computer, and open up Scratch. To test the functionality, let’s play with the Scratch sprite’s size feature using this block. Find these blocks and string them together. Move the (slider sensor value) block into the set size block to replace the size by the sensor value. Find the "Green Flag" Hat block and forever block under the Control palette, the set size block under the Looks palette, and the sensor value block under the Sensing palette. Click the green flag or the “hat” block to start your program. In a few seconds, you should see the red / green lights on your PicoBoard start flashing. Move the slider back and forth and watch what happens! The Sensor value reporter block can be used in place of any value field (blank / number) in Scratch. 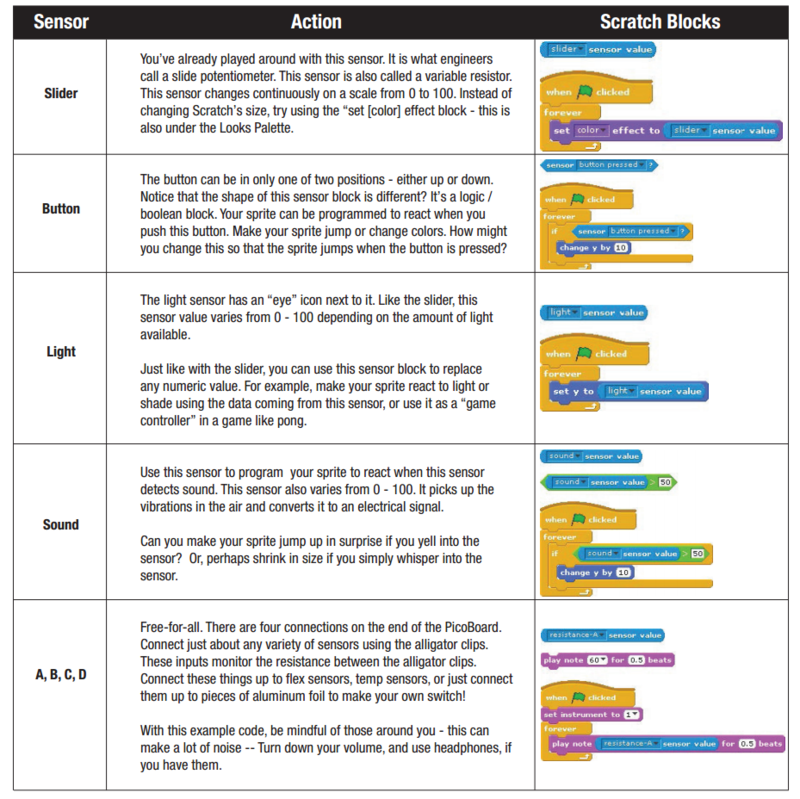 Experiment with any of the other Scratch blocks such as move ( ) steps or go to x: ( ) y: ( ). Any of these values can be replaced by the sensor value from the PicoBoard. 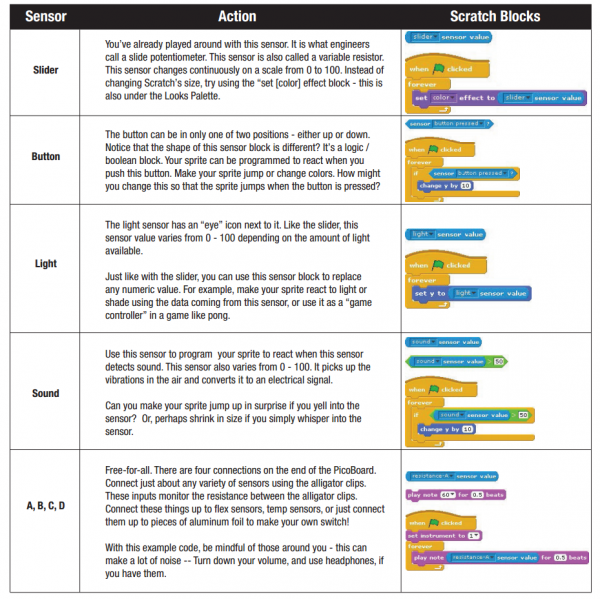 Find your favorite Scratch program and re-mix it using the Sensor blocks! The PicoBoard LabPack comes with several add-ons to attach the the auxiliary ports. The four additional ports (A-D) allow the PicoBoard to be connected to a number of other additional sensors. The PicoBoard measures the resistance across the two alligator clips. When plugging in the PicoBoard connectors, make sure that you push the connector all the way in. Plug an alligator clip into one of the PicoBoard end connectors. There are four end connectors. They are A, B, C, or D.
The most basic "sensor" is a simple switch. Switches allow us to electrically connect or disconnect a path for electricity between two metal connections. The PicoBoard senses whether or not the two alligator clips are connected. In the Add-on kit, we include two arcade switches. These switches are pretty neat. They use a momentary limit switch that has three connections to it. Connect one of the alligator clips to the inner-most tab. Connect the second alligator clip to the outer-most connection tab. All other resistive sensors are considered "analog" sensors. The PicoBoard will measure the resistance of the sensor and report a value that ranges from 0 to 100 in Scratch. 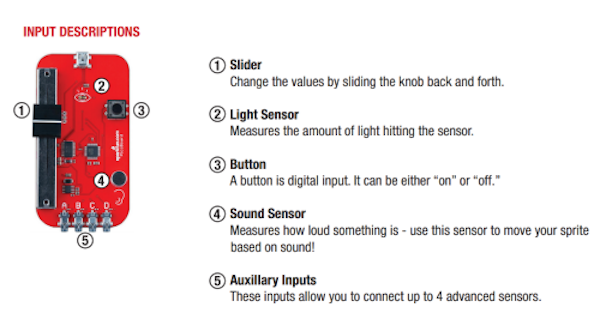 These values can be accessed using any of these blocks for the auxiliary sensors on A, B, C, or D.
A rotary potentiometer is basically the same as the slider -- however, instead of moving the slider back and forth, you simply turn the knob on the potentiometer. Connect one of the alligator clips to the center tab and the second alligator clip to either one of the outside tabs. Note: The limits of this sensor will only vary from 0 to 50 (instead of 0 to 100). Traditionally, a motor is an output device, but when connected to the PicoBoard, you can use the motor as a generator. Spin the motor and see what happens to your input values. Simply connect the two wires of the motor to the two alligator clips. 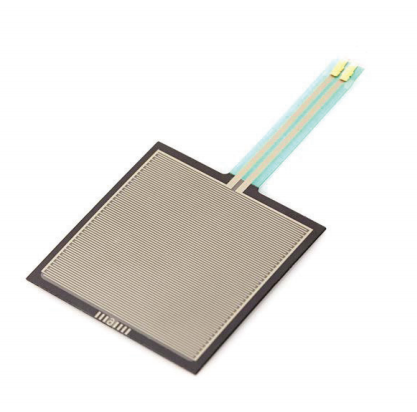 This square sensor senses pressure applied to the surface. As you press down on the square, the resistance changes. Attach the alligator clip extensions (regular alligator clip wires) onto the two metal prongs on the end of the Force Sensitive Resistor. When clipping, make sure that the metal clips are fully seated and touching the metal part of the sensor. Also, make certain that the alligator clips do not touch each other. 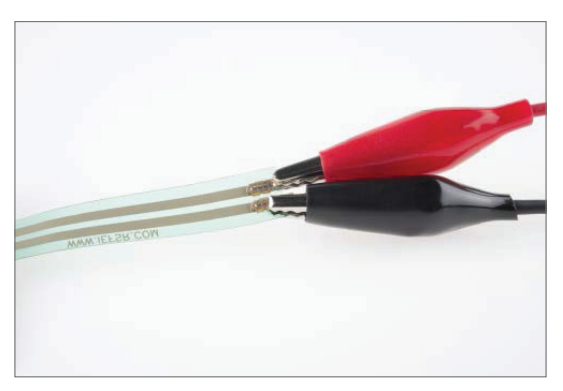 A thermistor is a special type of resistor whose resistance varies significantly with temperature. 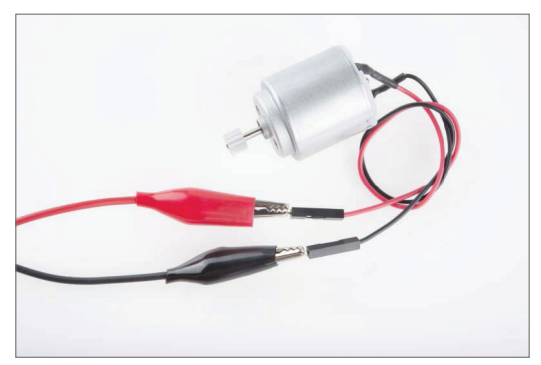 As the temperature increases, the resistance of a thermistor decreases. Technically, the thermistor requires the use of the Steinhart-hart equation to convert from the PicoBoard sensor values to a real temperature but, you can simply connect the thermistor up using the alligator clips. If you're interested in a guide to calibrating a thermistor in Scratch, check out our blog post on using a standard turkey thermometer in Scratch. Now that you have the PicoBoard set up correctly, you're ready to start playing with it. The sensor table describes each sensor, how you can use it, and the Scratch blocks that you could use to capture and use the sensor information (Click the image for a larger view). You're not limited to just the sensors that we include in the add-on kit. Experiment around with seeing what things are conductive and what things are not! Because the alligator clips measure resistivity (conductance), you can use this as a sensor for water salinity or conductivity of solutions. Check out these other educational SparkFun tutorials.